Opportunities for sightseeing in Branson are around every corner! Whether walking, driving, or letting someone else take the wheel, enjoying the sights of Branson and the beautiful hills, hollers, trees, and wildlife of the Ozarks’ countryside is a great way to spend a little bit of your vacation time. You’ll discover complimentary sightseeing opportunities, and ticketed attractions where sightseeing is either an important part of the adventure, or just a happy accident! 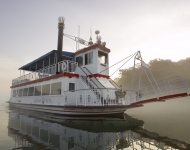 The Lake Queen – Branson’s Best Way to See Lake Taneycomo! Main Street Marina’s Lake Queen is a replica paddlewheel boat, designed to look like the actual paddlewheelers that once heavily populated the White River, the body of water on which the areas commerce depended before the construction of Table Rock Dam created two lakes, including Taneycomo. The Lake Queen is docked at Branson Landing, the multi-million dollar shopping, dining, and attractions development on Lake Taneycomo. Cruising Lake Taneycomo offers a peaceful way to explore nature, and a few interesting man-made sights. It’s not unusual to spot wildlife like bald eagles that nest right near the shoreline. Explore Branson on Land & Water? Only on a Duck! 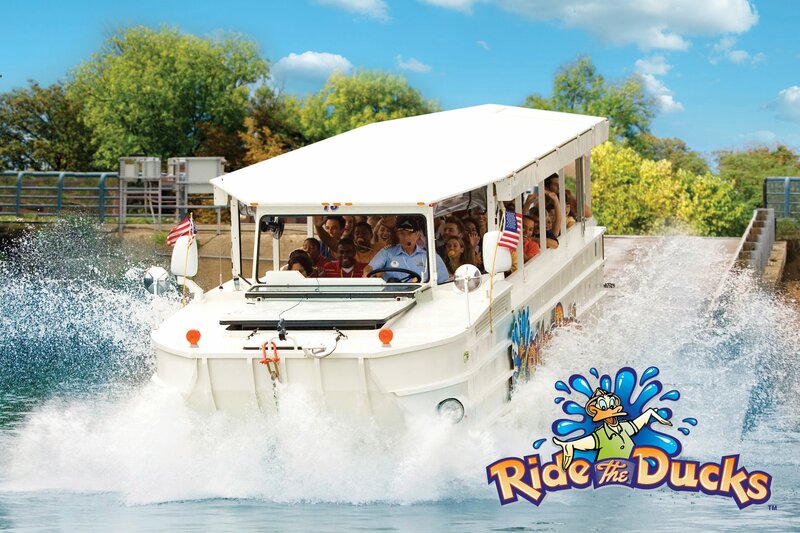 Ride The Ducks uses amphibious vehicles, originally designed for use during WWII, to take you on a guided tour along Branson’s famous Strip Highway 76; departing from the Duck’s building on the Strip. You’ll travel along a winding mountain road where vintage military vehicles and other fun things are displayed along the way to the top. Quack along with the captain and the music aboard a 70-minute adventure, and make a big splash near the Showboat Branson Belle. Enjoying Table Rock Lake Aboard the Showboat Branson Belle! 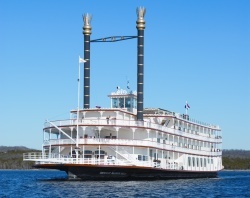 The Showboat Branson Belle features a wonderful dinner and live entertainment cruise. The Showboat is themed after the majestic showboats of the 1800s, and was christened in 1995. It measures 278 feet in length, weighs 2.5 million pounds, and can carry up to 700 passengers. There are three decks on the boat where you can enjoy panoramic views of the gorgeous clear water and the lush Ozark hills that surround the lake. Branson is Breathtaking from the Air! Charter Chopper Branson, operated by Davis Aviation, Inc, provides helicopter transporation for a wide range of services, both fun outings and business needs; if you need to get up in the air, Charter Chopper is there! Popular Branson sightseeing areas include Table Rock Dam, Powersite Dam, Lake Taneycomo, Silver Dollar City, the Strip (Highway 76), Branson Landing, and the Ozark Mountains in all their glory. How about taking your dinner date up a notch by arriving from the air? You can be delivered to any number of restaurants in Branson and Springfield. You can book a chopper to take incredible aerial photos, or go for the ultimate thrill of helicopter sky diving! Branson Boasts a Bounty of Sightseeing Options! A fun way to explore Historic Downtown Branson is aboard Sparky, the free tram that helps get folks around downtown, and to and from Branson Landing. Branson’s also teeming with plenty of man-made sights, a cruise down Highway 76, better known as the Branson Strip, is quite colorful, especially at night when neon signs are glowing. The facades of many theaters, museums, and attractions are interesting to see, and travelling along the Strip during the Christmas holiday is especially dazzling! And make sure you travel down side streets just off Highway 76 where other theaters and attractions can be found. 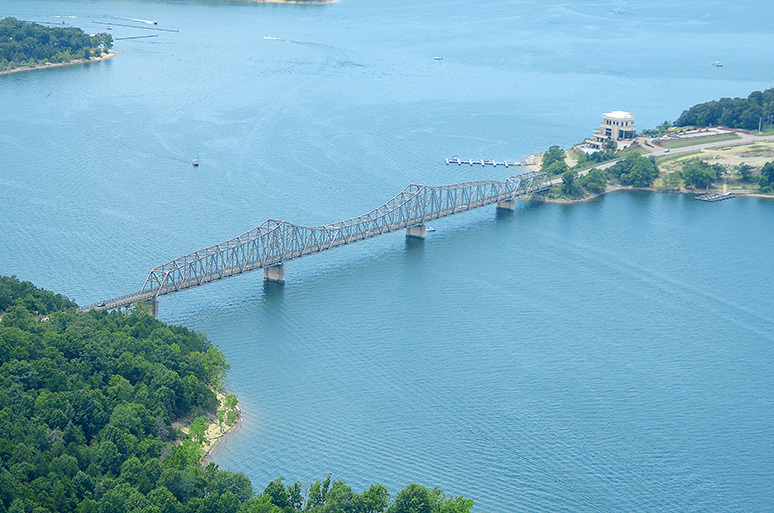 Another popular area for sightseeing is Table Rock Dam. You can see it from the Lake Taneycomo side when you make a free visit to the Shepherd of the Hills Fish Hatchery, or you can drive across the scenic mile-long stretch of the dam. You can drive around the area on the many scenic, winding roads during the fall to enjoy the foliage. There are helicopter tours of the area provided by Chopper Charters, and Branson Limousine has special tours available. No matter how or when you choose to venture around Branson and the lakes area, you’re sure to enjoy an afternoon of sightseeing in the Ozarks!